In the 2000s, British developer Data Design Interactive had the idea to remake the classic Amiga game Zool: Ninja of the Nth Dimision for the then-current console generation. This plan fell through when Zoo Digital Publishing, unimpressed with DDI’s efforts, canceled the project. Not to be deterred, DDI continued with the assets they created. Changing the theme and the protagonist, the end result was Ninjabread Man. The game was universally panned upon its 2005 release, becoming even more notorious in 2007 when DDI ported it to the Nintendo Wii under their Popcorn Arcade branding. Around the same time, DDI released another game utilizing the same engine as Ninjabread Man dubbed Anubis II. Does this game fare any better than Ninjabread Man, which is considered the textbook definition of shovelware? Anubis II is a 3D platforming game with a somewhat unique approach to stage design. That is to say, it could be considered an alternate take on the collectathon, a popular genre following the worldwide success of Super Mario 64. The first stage of the game is a tutorial that teaches you the basic controls. Pressing the “Z” button on the left nunchaku causes the title character to jump. He is capable of jumping a second time in midair as long as you time it properly. As you progress through the tutorial, you’re introduced to Anubis’s main means of defense. He can use the staff he carries to launch a melee attack. This is accomplished by swinging the Wii Remote. Players can also press the “B” button to fire spheres of energy from the staff. It’s aimed by pointing the remote at the screen and utilizing its IR sensor. If a valid target has been found, the reticle will turn red, indicating that they have locked onto an enemy. Defeating an enemy with the staff’s ranged attack increases the damage it inflicts. Anubis’s health is measured in hearts. Enemy attacks and natural hazards only take off a single unit of health at a time. Felling an enemy will cause them to often drop a winged heart. Naturally, collecting said heart will bolster his health. Anubis begins with five units of health, but can have as many as ten. If he collects an eleventh heart, the player will be granted an extra life at the cost of reducing the protagonist’s health back down to five units. The reason I can say that the game comes across as a collectahon is because the goal of each standard stage is to collect eight miniature pyramids. The artifact opens up a teleportation device, which transports Anubis to the next stage. These pyramids are typically out in the open, but if you’re having difficulties finding them, an arrow on the bottom-right corner of the screen points to the nearest one. Once you’ve obtained all of the pyramids, the arrow begins pointing towards the teleportation device. To help players, there are orbs scattered throughout stages. Once activated, they transform into arrows, and begin functioning as checkpoints. Any pyramid you may have obtained is forfeit if you lose a life before reaching the next checkpoint. Losing all of your lives will force you to restart the stage from the beginning. If anyone reading this played Ninjabread Man or learned of it through secondhand accounts, that person would be experiencing a sense of déjà vu. This is completely warranted because Anubis II is basically the same exact game as Ninjabread Man. DDI was clearly desperate enough to make money that they recycled assets across several games, including Anubis II. The tutorial stage in Anubis II is identical to the training Dough-Jo from Ninjabread Man – they even share the same the painfully bland music. It is because of this development that the answer to the hypothetical question I proposed at the end of my review’s introductory paragraph being no is a foregone conclusion. Even if one weren’t familiar with Ninjabread Man, it would only take a few seconds of playing Anubis II to realize that it’s terrible and has no chance of redeeming itself. The first problem lies in its controls. 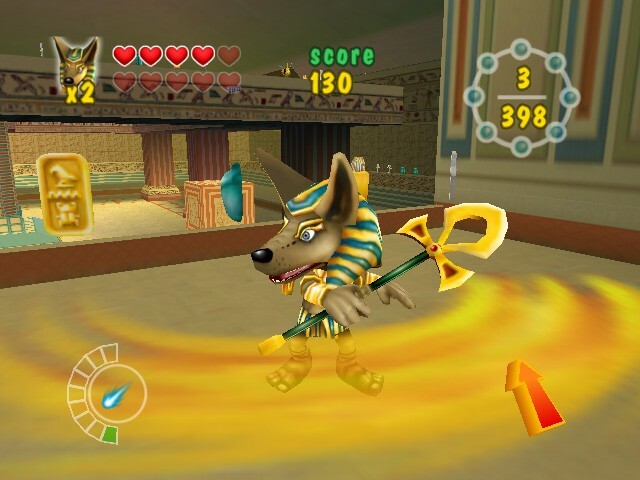 Anubis doesn’t gain momentum naturally; subtle manipulations of the control stick are enough to get him to start sprinting at full speed. This jarring transition makes landing jumps with any kind of precision nearly impossible. It doesn’t help that, unlike Ninjabread Man, there are a few segments which involve negotiating moving platforms. Not only is it impossible to gauge where they will reverse directions, but the controls ensure that your character will tumble into the abyss below more often than not. As is the case with many terrible 3D games, the player is afforded only the bare minimum of control over the camera. Players can aim the staff to move the camera, but when they’re not, they’re at the camera’s mercy. It’s as though DDI brazenly ignored the most important lesson from the success of Super Mario 64; in 3D action games, players need to control the camera to have any reasonable chance of success. Fixed cameras worked in 2D games because players could view the entire playing field. They aren’t nearly as effective in 3D games because basic character movements are quite a bit more complex with an extra axis to consider. This would have been excusable had Anubis II been released as a tech demo before or around the same time as Super Mario 64. As it stands, it was released for the first time in 2005 – nine years after developers everywhere had a definite template for 3D gaming. There is no excuse for this glaring oversight. Then again, most enthusiasts attempting to play Anubis II couldn’t help but have the reticle onscreen at all time given that the staff is completely useless as a melee weapon. The hit detection is appallingly implemented. The weapon can go right through the enemy without registering as a hit. It’s entirely possible that the attacks are indeed connecting, but with such little feedback provided to the player, it’s difficult to tell. To be completely fair, enemies seem to have difficulty striking Anubis as well, suggesting the poor hit detection is applied to both sides. On the other hand, it’s a common cited adage that two wrongs don’t make a right, and I feel it’s surprisingly applicable to this situation. Either way, this means that the energy spheres fired from the staff are far more effective when it comes to dealing with enemies. A majority of the enemies lack ranged attacks themselves and the staff never runs out of energy. The sole downside is that it’s difficult to engage enemies in close quarters with the staff beams, but there’s no reason why you shouldn’t attempt to dispatch them from a distance. In broad strokes, Anubis II is the same exact game as Ninjabread Man. However, there is one key difference between the two games that renders the former worse as a collectathon. While the gameplay of Ninjabread Man was woefully uninspired, it did feature a stage design that offered a degree of exploration. This isn’t the case with Anubis II. The pyramids may as well not exist because the stages are linear to the point where even unobservant players could spot them without the use of the arrow. In practice, the goal of these stages is merely to get to the end. While it is something of a relief in that one doesn’t have to waste time running back and forth across these stages, it proves what little care the developers put into this game. DDI just transplanted the Ninjabread Man model into another game without making sure it actually melded with the level design. 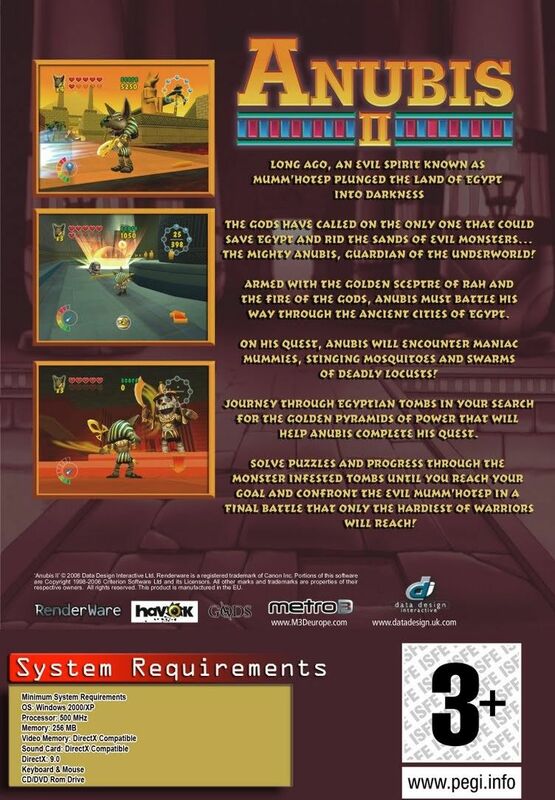 Moreover, Anubis II saw fit to add another annoying mechanic on top of the ones present in Ninjabread Man. Every now and again, you’ll happen upon a glowing ankh symbol embedded on a panel. By pointing the Wii Remote upwards and swinging it in a circle slowly, you can activate a nearby mechanism. It bears mentioning that the introduction of this mechanic is handled very poorly. When I played this stage for the first time, the tutorial box flashed onscreen so suddenly, I ended up exiting out of it by accident. What happened is that I ended up on the platform underneath the panels, causing the box to appear despite lacking the proper context. I then tried to press every button on the Wii Remote and the Nunchaku. When this failed, I realized I had to restart the stage from the beginning. Thankfully, these panels were placed at the beginning of the stage, but when I tried getting them to work, I still ran into problems. Specifically, I had to flail around ineffectually for a few seconds before my motions registered. Up until that point, Anubis simply swung his staff at the air around him. What’s worse is that many of these mechanisms affect the positioning of platforms. This leads to several moments in which you’ll move the platforms too much, requiring you to start over again. Other times, they’re used to perform actions such as lowering drawbridges or opening doors. This raises the question of why none of these actions are accomplished with a simple button press. 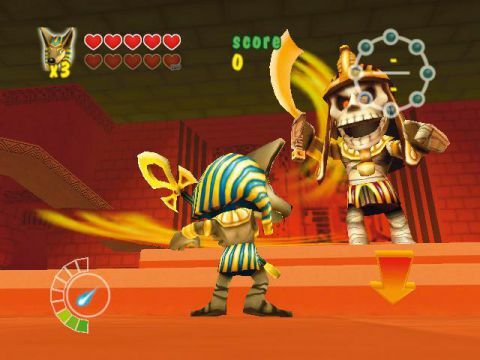 I understand that DDI wanted to capitalize on the highly touted motion controls of the Nintendo Wii when they ported Anubis II, but it was still completely unnecessary. 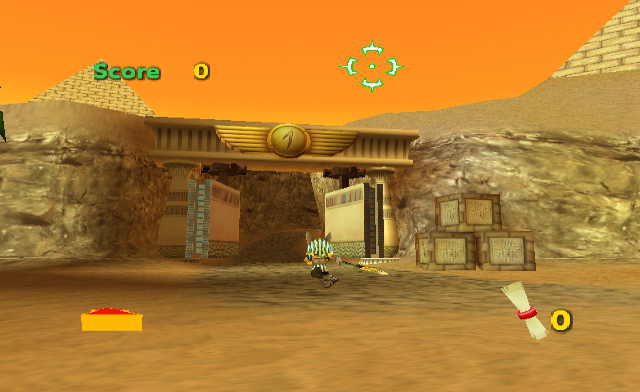 In between each stage, the player is taken to a bonus minigame wherein they must collect scarabs while dodging enemies. These segments are entirely pointless because the score and life counters are reset upon starting a new stage. The only reward you can get out of them is bragging rights from having set a high score, and letting people know that you have played this game earnestly for any reason is inadvisable. Another striking difference between Anubis II and Ninjabread Man is that the former’s nominal plot actually does factor into the proceedings. Ninjabread Man was content to claim that some sort of ultimate evil existed, which was subverted by a noticeable lack of boss fights. It didn’t even have an ending; anyone who completes the final stage is merely whisked away to the title screen as though nothing happened. 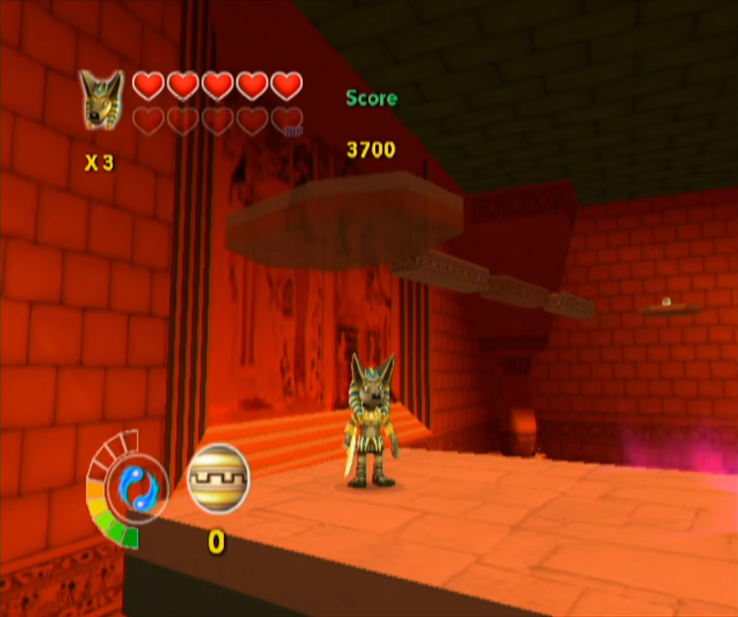 Anubis II, in addition to having more stages, does culminate in a boss fight. However, given the overall quality of game leading up to that moment, you’ll quickly wish DDI hadn’t bothered. The final stage ends with Anubis facing off against the aforementioned Mumm’Hotep. You’ll quickly discover that you cannot even get near the evil spirit, and Anubis’s scepter blasts have no effect on him whatsoever. Mumm’Hotep is content with throwing three fireballs at Anubis every other second or so, which are immensely difficult to dodge when saddled with unresponsive controls and unwieldy camera. Unfortunately, this is the least of the problems you will have. Mumm’Hotep can only be harmed using bombs. Getting these bombs in the first place is quite a chore because they reside in the upper portions of the arena. The only way to reach them is to navigate two different series of platforms that periodically appear and disappear with little rhyme or reason. Mercifully, the platforms take some time before they’re completely rendered intangible, but it’s still an irritating gimmick. What’s worse is that the bombs have a very biased hitbox. If you do not land dead-center in their models, you will not collect them. Once you’ve obtained the bombs, you’ll realize your troubles aren’t quite over. This is because the designers dispensed with the entirely preposterous notion of actually teaching players how to throw these bombs by not including any kind of visual aids whatsoever. As broken as they were, every other mechanic received an explanation when they become relevant for the first time, but not this one. DDI was so dedicated to leaving players in the dark that they didn’t even bother outlining how to throw the bombs in the instruction manual. You have to hold the “A” button and swing the remote in a way that mimics the motion of tossing an object. The worst part about all of this is that even when you learn what to do, it’s easy to believe you received fallacious information. I myself took several tries before I got any kind of response out of the game. When the game finally relents that you performed the motion correctly, Anubis proceeds to toss the bomb halfway across the room. You have no means of aiming precisely either; he will toss the bomb in the direction he’s facing regardless of the camera’s positioning. Consequently, the only place from which these bombs can be safely tossed is in the four corners of the room. For good measure, experimenting with the motion controls invariably leaves Anubis open to Mumm’Hotep’s attacks. Even better, Anubis’s throwing animation locks him in place, all but guaranteeing a hit from a looming fireball. After defeating the evil Mumm’Hotep, you guide Anubis to the final teleportation device whereupon the game briefly congratulates you on your victory before whisking the player away to the title screen. It is nice that, unlike Ninjabread Man, Anubis II actually has something vaguely resembling an ending. However, that the game can be completed in less than two hours from start to finish negates whatever little goodwill may have stemmed from such a gesture. There are extra modes such as a time attack and one that involves scouring the same stages for treasures, but they’re clearly a cheap substitute for the game’s noticeable lack of substance. 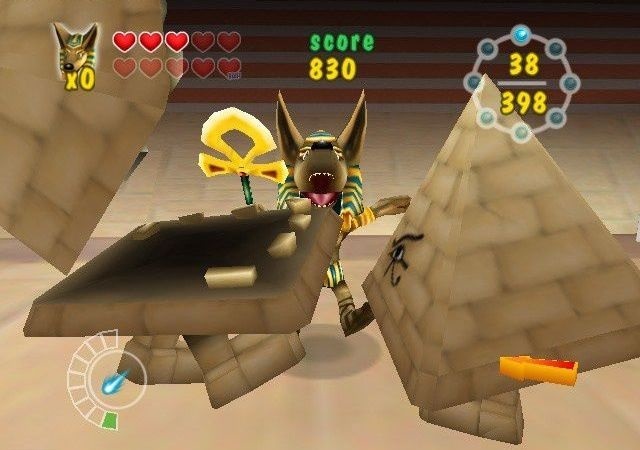 Anubis II may not be as blatantly lazy as Ninjabread Man, but it deserves a place alongside its sister title as one of the worst games of the 2000s. Ultimately, I feel my concluding statements regarding Anubis II should be proportional in length to the amount of effort that went into its development. With that declaration in mind, I’ll just say what is painstakingly obvious by now – this game is complete garbage and charging any price for it was truly unconscionable. The end. Honestly though, the way you described it, I would put Extremely Short in the Pros column. Unless I payed money for it. Which I have no intention of, obviously. Thank you for suffering for me. No problem! If I’ve convinced you to stay away from this game, I’ve done my job. That thought did occur to me, but I kept “Extremely short” in the “Cons” list because if I’m to the point where I’m actively glad that a game was over in two hours, it’s a pretty damning assessment of its quality (plus, that would imply the game actually has redeeming qualities). I myself paid money for it, but it was being sold by a Goodwill outlet on eBay. Therefore, I got to experience this terrible game, write a review about it, and donate $6 to charity all in one transaction, so everybody wins. Oh yeah, it’s a con if you buy a game, any game and you only get 2 hours playtime. But yes I’m gladly avoiding this game. So far so good. Definitely a bargain when looked at like that. Added bonus, when you’re done with it you could always donate it to a shop and let the cycle happen again. Just tell me which shop so I can avoid it :). Ah DDI. The LJN game label of the 21st Century. Anubis II was not their only reskin. They did this with several of their games. The worst of them being Action Girlz Racing, which to date is the worst game I have ever played in my entire life. That isn’t hyperbole. That’s an apt comparison, though many LJN games actually had redeeming qualities (okay, maybe not Bill & Ted). The same couldn’t be said of the DDI games I’ve played. Reskinning the same vapid game three times is inexcusable. I have little doubt that Action Girlz Racing is a bad game, though it would be amazing if it topped NES Dragon’s Lair as the worst game I’ve ever played. It’s like two dollars. I challenge you to play AGR, and see if you don’t move Dragon’s Lair a few notches down. It is THAT bad. I may end up doing that in the future. If I need another 1/10 game to review, I’ll certainly know where to look. I have never played it, but I remember all the reviews back when it came out. You are a brave soul for going into games like this one. I never heard of Anubis II until I got the “bright” idea to play Ninjabread Man. It’s slightly better, but that’s not saying much. Thanks! It’s not easy playing these terrible games, but I always like how the reviews turn out. I feel that you want me to track this game down and try it out. You’re welcome to do so. If you want to feel immense frustration for two hours, that is. You can tell that some games are garbage just by the name and box art. I think the company that made the recent Gianna Sisters games should try to get the rights for Zool. They could probably do that series justice. 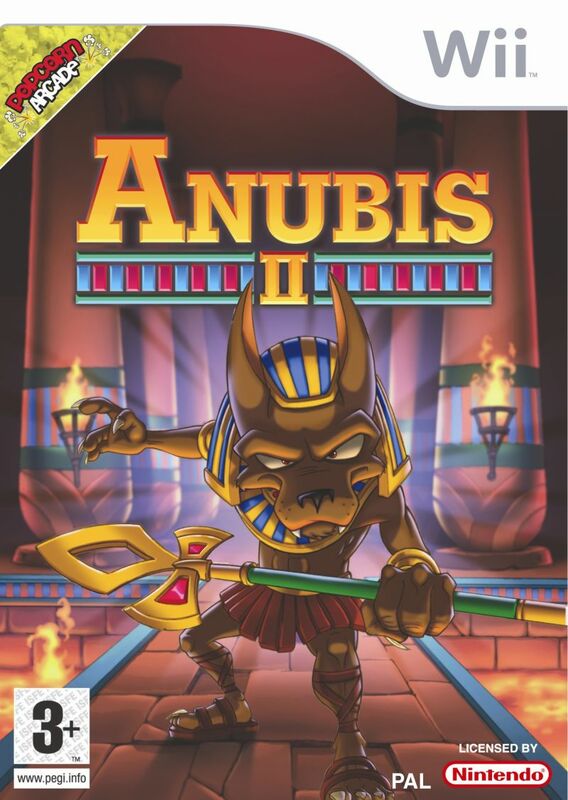 The box art of Anubis II isn’t the worst I’ve seen. I’ve felt that video game box art as of late tends to be rather bland (movie posters too for that matter) and Anubis II is at least vaguely eye-catching. The same is technically true about its gameplay, but that’s not a good thing. I’ve heard great things about Zool, so a remake of that game would be grand. This is Anubis II. Does that mean there’s an Anubis I? That thought is fearsome to me. Not quite as fearsome as what must have been going through your head when you decided to review this, though. A Ninjabread Man clone? That sounds like something that’s better left to the ravages of time. I think it’s supposed to be pronounced “Anubis the Second”: the character’s name. Luckily, this means a direct predecessor does not exist. Unluckily, it’s as much of a waste of coding as Ninjabread Man. Oh, what was going through my head was straightforward enough; if DDI was going to flood the Wii with shovelware, they deserve every 1/10 that such a cynical approach entails. That and being only two hours long, it was very easy to review.